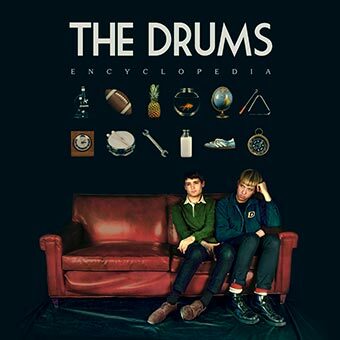 The Drums are Jonny Pierce and Jacob Graham, and their 3rd full length album "Encyclopedia" is set to be released September 23 in Canada. Emerging from Brooklyn in 2009, they smashed on the scene with their Summertime! EP that led to a spot on the BBC Sound of 2010 shortlist, The ShockWaves NME Tour, and the publication's Phillip Hall Radar Award. The Drums were also voted "Best Hope for 2010" in Pitchfork Media's 2009 Readers' Poll. The Drums' music often explores the themes of loss, nostalgia, redemption, vulnerability, and love - with critic's raves embracing both the lyrics and their sonic signature. This time around, they've embraced a darker sound while making it as grand and majestic as they please. "Encyclopedia is full of magic and surprise while maintaining a serious, more weighty tone throughout," says Jonny. "We were feeling very angry, confused, and alone when we made this album; and we wanted to be very honest this time around, even if being honest meant making some people uncomfortable. We've left the beach for higher ground, always searching for hope." The upcoming LP marks the first time since the Summertime! EP that Jacob and Jonny were left to their own devices, without having to ask a soul for approval. The result is an exciting display of personal emotion and unashamed, majestic songwriting style.